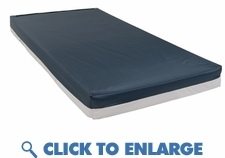 This bariatric foam mattress is ideal for pressure relief and bed sore prevention and healing. The high quality pressure relief foam reduces painful pressure points. Designed to replace an uncomfortable inner spring mattresses. It can be used over a box spring or medical bed frame. The foam mattresses 7" depth acts as a full mattress replacement. Ideal for home health care or institutional use. This foam pressure prevention mattress is the first line of defense in bed sore healing and decubitus ulcer prevention. The cover is washable, low shear, fluid proof, anti-bacterial, and anti-static for easy use and care. This bariatric foam mattress is ideal for pressure relief and bed sore prevention and healing. The high quality pressure relief foam reduces painful pressure points. Designed to replace an uncomfortable inner spring mattresses. It can be used over a box spring or medical bed frame. The foam mattresses 7" depth acts as a full mattress replacement. Ideal for home health care or institutional use. This foam pressure prevention mattress is the first line of defense in bed sore healing and decubitus ulcer prevention. The cover is washable, low shear, fluid proof, anti-bacterial, and anti-static for easy use and care. Carton Shipping Weight	27 lbs. Weight Limit	600 750 1000 lbs.